My first introduction to painting was in primary school during compulsory art classes. We used tempera on paper, and only the very talented graduated to watercolours. Most of us hated it and my pedantic results convinced me that I had no artistic ability at all. Years later I tried oils, and suddenly painting became a joy. I understand that toxicity was then a big concern, not to mention the complicated clean-up of brushes, but I'm convinced that, had we been using acrylic paints, our collective creativity would have soared. This comprehensive assortment of acrylic paints in 24 gorgeous saturated colours is the ideal way to encourage artistic tendencies in novice painters. I didn't say “young” because one can be a beginner at any age and I remember how my mother-in-law surprised us all by producing delightful, colourful still lifes within days of picking up a paint brush for the first time in her long life. These paints have the great advantage of being water-based, so the clean up is done with soap and water without any need for turpentine or mineral spirits, which are unpleasant to use and can be unhealthy. The trick with acrylics is to buy high quality paints, because with this medium there is a huge difference between “scholastic” grade and “professional” quality, not only in how well the paint lasts in time but also how much pigment it contains and how easy it is to work with. 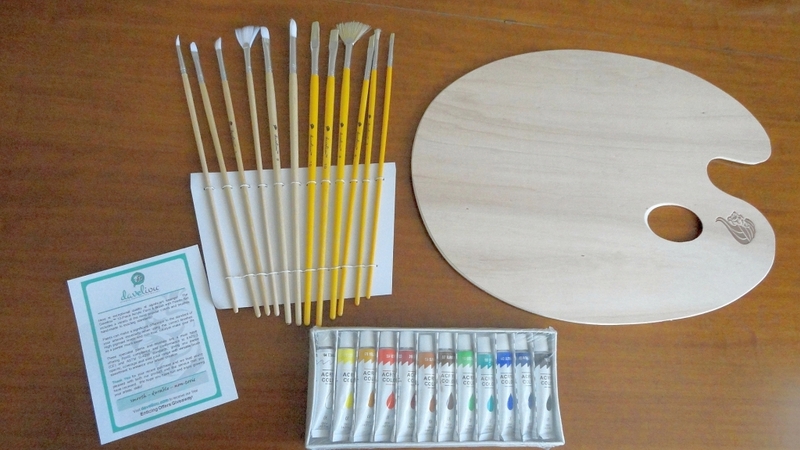 Acrylics are also the most versatile medium and can be used to mimic watercolours or oils or something in between. Definitely the best to stimulate creativity and well suited to impatient people because the paint dries quickly and lends itself to a more immediate style than oils. I received a box of paints for evaluation and review purposes and wasn't sure I would like them as much as oils, but having tried them on artist paper and on wood, I'm having a lot of fun experimenting and really love the texture and colour density of this brand. 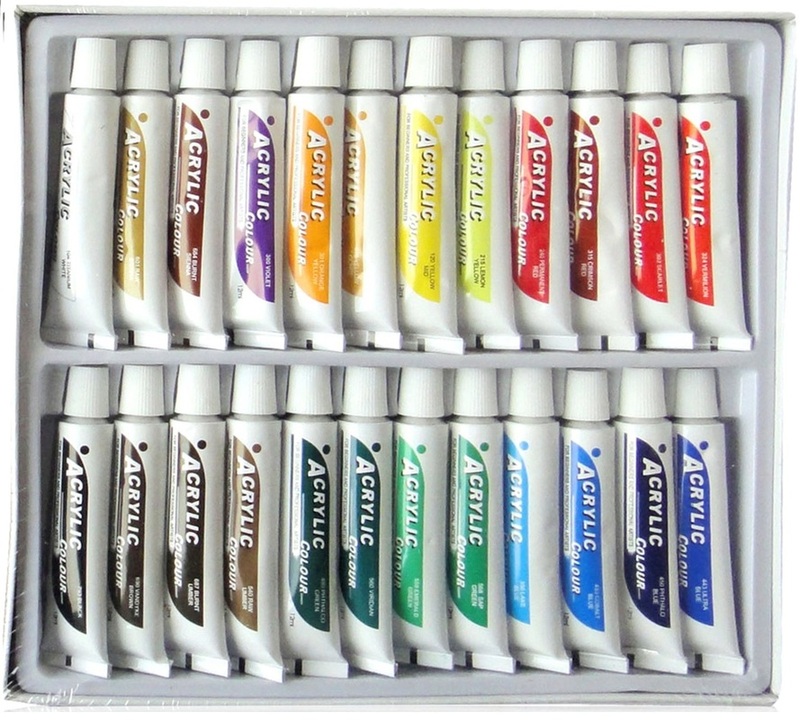 If you or someone you know wants to experience the joy of creating a unique masterpiece with paint on a variety of supports, this set of vivid acrylic paints would be a very good choice especially since having so many pre-mixed hues is a definite advantage with a fast-drying medium. This beautiful set has “gift” written all over it. But the lucky recipient could just as well be yourself. It is certainly the sort of thing I would pick for myself, when looking to start painting with acrylics. It's also a great way to refresh you old supplies, as in my case. I used to paint a very long time ago and now that I want to do some more, I find that my old brushes are in poor shape and my old paints are dried up and useless. This comprehensive set was sent to me for review and it could not have come at a better time. The set includes a proper-sized wooden palette, which I think is so much nicer than a disposable plastic dish, not least because it is shaped to be held in your hand. Whether you paint out of doors or inside a room, having your paints close to you is definitely an advantage, especially if you use an easel. 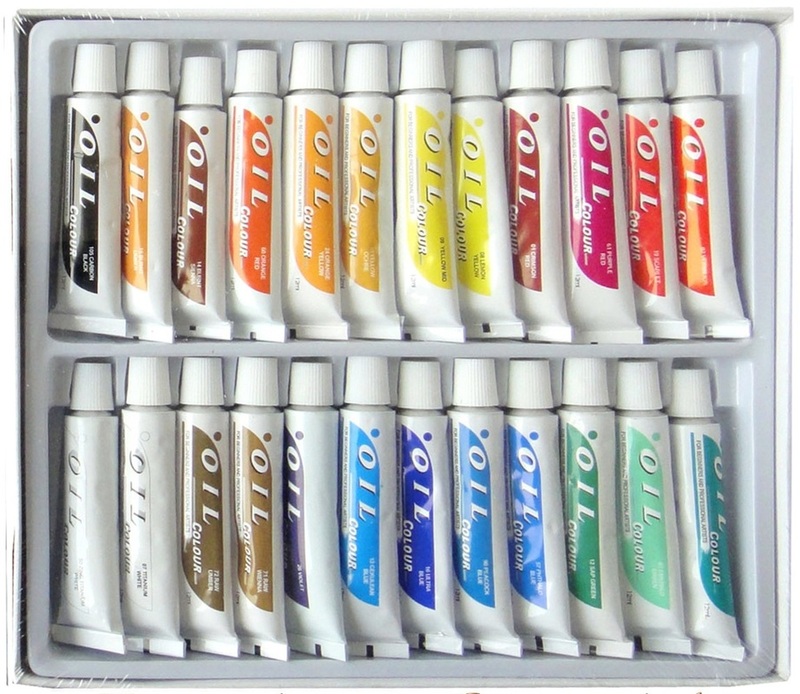 There is also a very fine assortment of twelve tubes of acrylic paints (12 ml), gorgeous, saturated colours that are easy to mix and a pleasure to handle. And to give you plenty of artistic choices with the application, twelve acrylic-appropriate brushes are provided of two different types: six each with nylon and bristle heads. The brushes are also of very fine quality, with smooth and very long wooden handles and tight ferrules that keep the brushes from shedding. Acrylics are also the most versatile medium, they can be used to mimic watercolours or oils or something in between. They also lend themselves to the most inventive uses because you can use them to paint over wood, canvas, fabric, ceramic and many other supports, as well as the more traditional paper pads. One of my first projects was to decorate an old flower vase. I liked the shape but hated the gaudy design. Now it holds my favourite roses and it gives me pleasure to look at it. I used to paint a long time ago, using the time-honoured technique of copying the work of others, not because I had any illusions of being an artist, but simply because it was an inexpensive way to put some beautiful scene on my walls. The other reason, of course, was that I really enjoy working with colour and, once I discovered that with oil paint you can go over your mistakes, it became my medium of choice. My best efforts are hanging on my walls, and still giving me pleasure, a testament to the durability of oils. Lately there was a bare wall I wanted to bring to life and I was toying with the idea of digging out my old supplies when the offer came to test and review painting supplies from Daveliou. 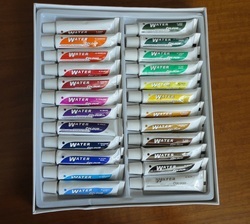 When the paint boxes arrived I thought the tubes looked small (12 ml) but once I started to use them, it became clear that this is not just a starter set, but the beginning of a beautiful addiction and an ideal gift for a novice. Some painters like to slap oils on with abandon, even with a knife, but using the thickness to build texture is only one technique. The beauty of this set is that it has 24 pre-mixed shades and any beginner will tell you that mixing colours is one of the trickiest skills to master, even before you put brush to canvas. In theory, you could make do with seven or eight basic colours, but the convenience of having so many vibrant shades ready to use cannot be overstated. You will still be mixing, but your base will be a well-balanced clean colour. The other thing I really like about this set is the consistency of the medium. I remember having to add so much linseed oil to some brands that the work would take days to dry. These paints have a lovely consistency, not too thick, not too runny, so you can work quickly and even start to overlap a little on your first day. These paints are also non-toxic, which is always nice if you care about your health and that of your family. As far as I can tell, the quality is high and the low price is probably introductory. As for durability, only time will tell, but the lifetime guarantee suggests to me that the maker is confident. I have never really mastered watercolours, even though I started “painting” with them early on. In school we had those tin boxes with small pans of colours and my dabs of tinted water never stayed within the lines. My efforts were horrible, even I could see that. Later on I discovered oils and everything changed. You could go over your mistakes, many times if necessary. Once I painted a nice bowl of fruit on top of a failed Bay of Naples. Same with acrylics, thick pigments you could mix and the ability to overlap. I had nothing more to do with watercolours. When I was offered a box of these watercolour paints to review, my first thought was: how come they're in tubes? I discovered that it is because they are quality paints. What I was using was scholastic grade. 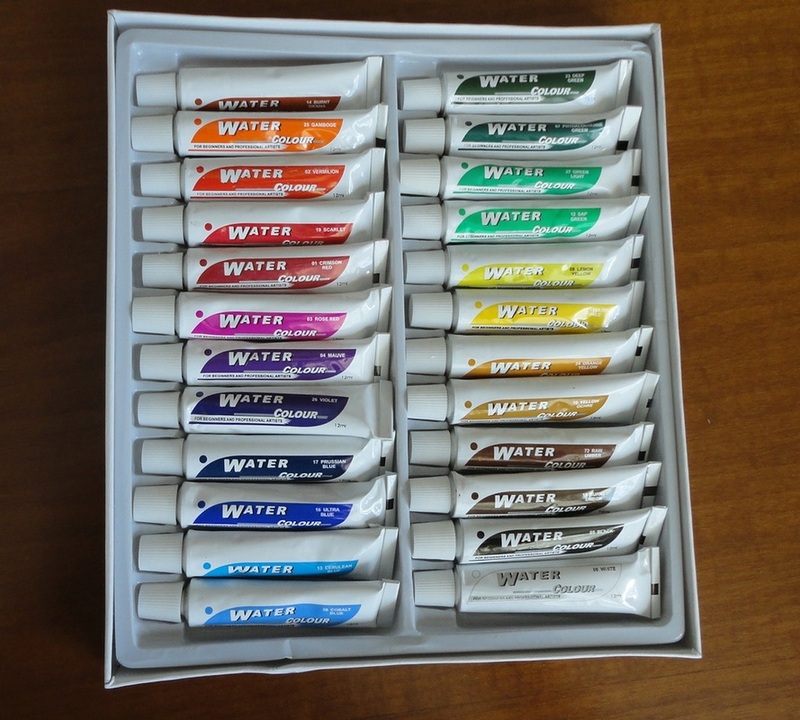 Proper watercolours come in tubes! These watercolour paints are a lot more liquid than either oils or acrylics but they can be mixed! A whole new horizon has opened up and I am now joyfully experimenting with them. On the other hand, they are supposed to be the easiest of paints for children to play with, you can even fingerpaint with them (this brand makes non toxic paints, so no worries there), but I still consider them the most challenging of mediums, and I'm really looking forward to conquering this new technique, while having more fun than I thought possible. There are 24 pre-mixed beautiful colours in the box. So you can tackle almost anything while you get the hang of mixing your own hues. Perfect for encouraging latent artistic tendencies in novice painters. The tubes are small (12 ml) but there are so many that they should see you through the initial stages until you figure out which ones you use the most. Like acrylics, these paints are water-based so they dry fast, and cleaning up is easy and painless with just soap and water. What defines quality with watercolours is, apparently, their ability to resist fading in time. It's too early for me to comment on that, but the lifetime guarantee, which the maker extends on all purchases, gives me a certain confidence. If you or your kids are exploring their creative potential, you might consider this purchase as a good way to start.